Thankfully the vast landmasses of Russia and India have enough charming regions and towns that are free from the globalist monster that manifests itself in multinational brands. Whether it’s a modern North American metropolis, a historic city centre in many a European country or a futuristic East Asian boomtown, the one common factor that is visible is a Western fast food or retail outlet. It’s become next to impossible to escape sighting a Louis Vuitton shop or a McDonald’s in most parts of the world. The latter seems to be a favourite for Western tourists who are too conservative to try local cuisine overseas as well as “aspiring Westerners,” particularly young people who seem to find it “cool” to be seen at or eating in the restaurant. Even Ho Chi Minh City hasn’t managed to escape the expansion of Western brand outlets. Leave it to these multinational giants and it will be next to impossible to distinguish one continent from another. China, the former “Socialist Paradise” has fallen prey to the expansion of global brands and it’s a funny sight to see visitors from small towns in the southern part of the country rushing to stores in Hong Kong to buy Italian underwear! Personally I feel globalisation has its fair share of benefits. It’s a lot easier to travel now that it was even a decade ago. In many ways, distances are becoming irrelevant but the thought of seeing the same kind of things all over the world is even more boring than taking a walk in an area with nothing but Khrushchev-era 5-floor buildings in some corner of the former Soviet Union. Russia and India are two countries, which are open yet still have not been swallowed whole by the ravaging invasion of multinational brands. Sure, Moscow and St Petersburg and Indian metros have fallen prey to one of the curses of globalisation. Mumbai’s Irani restaurants have almost completely vanished off the face of the earth. When I told a Muscovite friend that I wanted to eat a nice Russian meal near the Belorussky station, I was laughed at and offered French, Italian or Japanese food instead. Every international city should have a range of international dining options but not at the cost of local cuisine vanishing off the map. Move away from the large cities of Russia and India and a whole new world opens up. Places may in some way be touristy but at the same time do not look like a ghetto with signs that remind someone of home. The town of Naggar in the Kullu Valley, which houses the Roerich family estate, has a nice set of small restaurants that serve good cuisine from Himachal along with Punjabi dhabas and the odd small restaurant set up for visitors from a foreign country, but the landscape is far from being littered with Golden Arches. 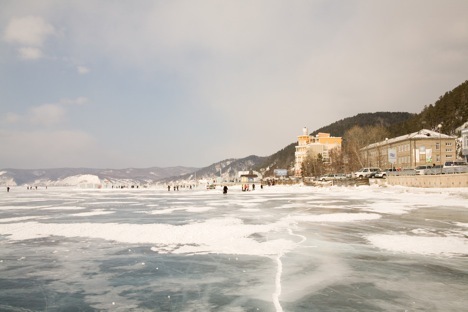 The same can be said of Listvyanka, a charming town by Lake Baikal. There are plenty of small places that serve Omul, what I consider the tastiest fish on the planet. The northeast of India and the Russian Far East are also places that are relatively free from the globalist monster. Some areas in these regions are considered sensitive from a security point of view and special permissions were/are needed for locals and foreigners to enter them, but they are well worth the bureaucracy. Arunachal Pradesh in India and Chukotka in Russia come immediately to mind. It’s hard to imagine a Costa Coffee popping up in Tawang or the Chukchi excited about shopping at a local Zara outlet. I am not hinting that all Westerners are like that former colleague of mine; far from it. But a large number of people from the so-called First World walk around with a strange combination of unreal expectations and preconceived notions. So it becomes that much easier to spot the unpleasant sights in a country like Russia and India, while at the same time complaining about how something they are used to back home doesn’t exist in these countries. I can’t see eye to eye with my Western friends who have happily accepted what their media tells them about Sochi, but then again, these impressions are changing thanks to athletes and people who have actually visited the Olympic city. For those that want to be far away from a world, where one place looks like another, head to Kerala or Karelia, Siberia or Sikkim or hundreds of places in Russia and India that have managed to preserve their character.